Equinox Engineering and SITE Resources Group are pleased to announce they have entered into a joint venture agreement under the name of “Stratus Project Solutions”. Stratus has been developed to provide our clients a full EPC service solution. SITE and Equinox are both local, privately owned and operated, mid-sized companies. Stratus’ primary focus is on heavy oil offsite and field facility projects. Stratus was created to provide our clients with a “one-stop shop” approach that is tailored specifically to thermal wellpad and pipeline design & construction. Stratus provides a full suite of services including, but not limited to: engineering, procurement, module fabrication, earthworks & construction. Construction services offered include piling/structural, mechanical, heat tracing, insulation, electrical, automation, commissioning and start-up support. Stratus’ strength is our ability to assemble and maintain premium engineering and construction teams. Leveraging our experience with EPC Projects, Stratus delivers practical designs as well as safe and efficient execution strategies for our clients. The result is a cost competitive and fit for purpose total project solution. Equinox is a world-class provider of EPCM services to the global oil and gas marketplace. Founded in 1997, Equinox has successfully executed over 5000 significant projects in Canada and around the world. Equinox has a worldwide presence with offices in Calgary (Canada), Brisbane (Australia) and Pune (India) with projects executed in fourteen countries and four continents. Equinox has industry leading expertise in the engineering and design of thermal wellpad and pipeline systems. Its services include Conceptual Studies, Front End Engineering Design, Detail Design, Procurement, Construction Management, Commissioning & Operations Support. Equinox’s design philosophy for SAGD and CSS wellpads is to “design one, build many”. Equinox works with its clients to develop a sustainable design. This design will incorporate all requirements of the reservoir and process conditions while being balanced against the requirements of the production strategy, facility design and operational preferences. Equinox provides its clients with standardized designs and strives for continuous improvement and optimization. The result is execution consistency and project cost certainty. Equinox offers full engineering services at all stages of pipeline projects from conceptual project planning through to construction and commissioning. The pipeline team has successfully executed multiple thermal pipeline projects for various clients. Equinox’s in-house design capabilities cover all aspects of thermal pipeline design including earthworks, transient flow and stress analysis, pipeline and structure design as well as heat trace and communications systems. SITE Resource Group Inc. has roots going back to the 1980s in the SAGD resource play development. SITE’s current platform company was formed in 1993 in Cold Lake Alberta, the heart of the SAGD industry. Through this time SITE has developed “Best in Class” processes and procedures while constructing thermal facilities for over 50% of the owners in the Wood Buffalo Region. SITE operates in Cold Lake, Conklin and Fort McMurray with extended services throughout Western Canada. SITE is the industry leader in above-ground pipeline construction, having adapted to new and changing welding requirements to ensure the premium quality of product for our clients. SITE’s complimentary and stand-alone services include geomatics, clearing, logging and mulching, civil earthworks, piling and structural, mechanical construction, insulation, environmental reclamation and remediation. SITE’s total value creation is delivered by managing multiple scopes of work, whether self-performing or while managing 3rd parties congruently. This insures our clients receive a quality product/service meeting budget and schedule requirements while maintaining a safe work site. SITE’s highly experienced construction leaders are respected for their vision and ability to execute safely, on time and on budget with a high degree of quality. Our leaders ensure there is total alignment of all services. in reduction of schedule and capital cost. Stratus’ thermal wellpad team provides expertise in a lean project execution model which focuses on capital cost reduction, full project schedule reduction and functional and safe operable designs. Combining the efforts of engineering, procurement, shop fabrication, field assembly, construction and start-up support enables safe and cost-effective implementation of simple wellpad solutions. The Stratus team can provide project-specific solutions to numerous thermal recovery strategies. The team has design solutions for multiple artificial lift systems. Stratus offers our clients design execution strategies that minimize overall wellpad capital costs through reduction/elimination of equipment, field electrical / instrumentation and general construction activities. 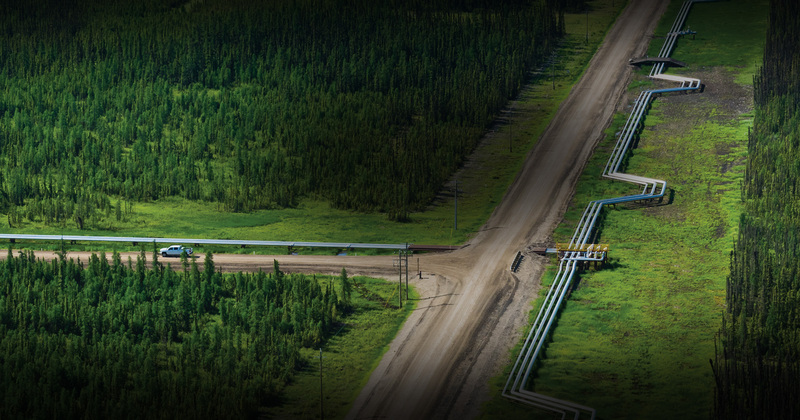 Stratus has significant experience in earthworks design associated with heavy oil projects. Its earthwork design & construction experience includes wellpads, access roads, construction camps and borrow pits. Stratus has industry experts in the specialized design & construction requirements for earthworks design including muskeg consolidation, foundation design, traffic accommodation, geotechnical evaluation, surface gravel requirements, turning radius, heave monitoring, and surface water handling. The Stratus team is an industry leader in design and construction of high temperature, above-ground pipelines for thermal projects. We are experts in the specialized design requirements for high temperature thermal pipelines including process hydraulics, material selection, prefabricated pipe shoes & supports, detailed stress analysis, transient analysis, welding specifications, fit for purpose pile design, road/highway and wildlife crossings. Stratus has experience in many design philosophies and construction methods. This ranges from traditional on-site methods to various levels of prefabrication & preinsulation techniques which allows Stratus to provide the best execution strategy for its client’s specific project needs. scope changes between engineering and construction . © 2017 Stratus EPC. All Rights Reserved.